Hello everyone! I am sharing a card today for the Brutus Monroe blog hop which is featuring their subscription products for the month! I first took a panel of Bristol Smooth paper and blended across is with some rainbow colors of Distress Oxide ink. I then took the stencil of the month and placed it on top and pressed embossing ink through it onto the blended panel. I embossed the stencil design with the embossing powder of the month which is the color pearl. I popped up the panel onto a card base with foam tape. I added a strip of black glitterstock along the edge of the card. For the sentiment I took out the stamp of the month and stamped the “hoppy spring” sentiment in black ink on white cardstock. I popped up the sentiment strips onto the card with foam tape. To finish up the card I went over the sentiment with Wink of Stella glitter and I added some sequins. Hello my crafty friends! Today I am sharing a fuse tool shaker card using some products from My Favorite Things. I used Spun Sugar Distress Oxide ink and the cloud stencil from My Favorite Things to create a cloudy background panel. I then closed that panel up into a shaker pocket with my fuse tool, adding in some sequins from Lucy’s Cards. I stamped some of the images from the Rainbows and Unicorns stamp set and colored them in with Copics. I also stamped a sentiment from that set onto Cotton Candy cardstock from Simon Says Stamp and embossed it with Alabaster white embossing powder. I adhered the shaker pocket to an A2 card base with my ATG gun. I then glued the sentiment strip and the rainbow image along the bottom of the card. I die cut some clouds out of vellum and placed them above the sentiment. I glued the unicorn down over the clouds and onto the card. To finish up this card I added some highlights to the images with a white gel pen. I then went over all of the clouds with my Wink of Stella glitter brush. Hello crafty friends! For today’s card I used the Gina K Designs Wreath Builder Templates to create a fun rainbow heart card. 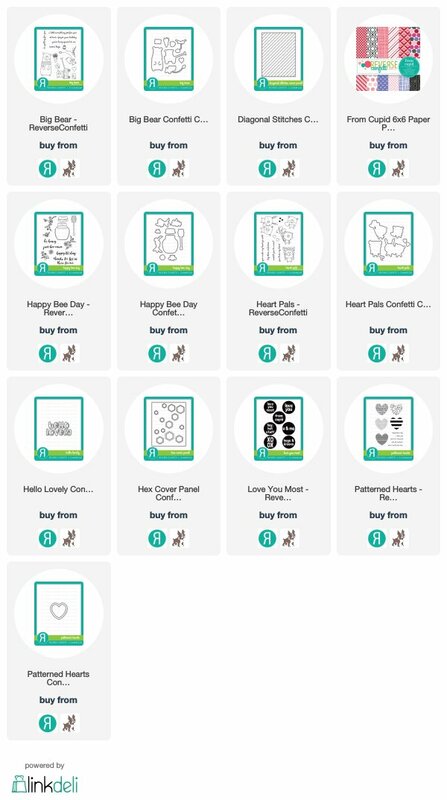 I stamped two rings of hearts from the Ornate Love stamp set using the 4 inch wreath builder template. I used Distress Oxide inks from the stamping in the colors Candied Apple, Carved Pumpkin, Mustard Seed, Twisted Citron, Mowed Lawn, Tumbled Glass, Mermaid Lagoon, and Seedless Preserves. I added details to the ring of hearts by added smaller hearts and embossing them with Icicle (clear) embossing powder. I added a border to the four corners with a stamp from the Deco Borders and Corners stamp set and embossed that with Sterling embossing powder. I stamped my sentiment on Bazzill Licorice Twist cardstock and embossed it with Alabaster white embossing powder. I fussy cut the sentiment out with scissors. I mounted my heart background onto a piece of black cardstock which was slightly larger. I then popped that panel up onto a black card base with foam tape. I adhered the sentiment with tiny pieces of foam tape. For the finishing touches I went over the sentiment and outer border with my Wink of Stella glitter brush. I also added a few sequins.